My name is Marilyn Hamilton and I was born and raised in Grand Rapids, Michigan. I am a childcare teacher in Room 4. I have a Master’s Degree from Eastern Michigan University in Organizational Communications and I worked in Human Resources for five years in the Detroit Metro area. I received my teacher certification from Wayne State University, with a major in Communications and a minor in English. My previous teaching experience includes teaching middle and high school students for sixteen years. I also obtained a Master’s Degree in Learning Disabilities from Oakland University and taught in the Plymouth-Canton and Livonia school districts for three years. I have a brother who lives in New York. My hobbies are traveling, watching movies, going to wine tastings, shopping and spending time with my family and friends. 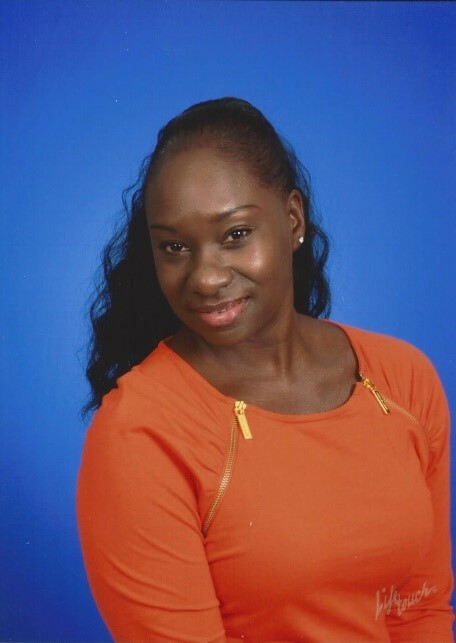 I am also a member of the Delta Sigma Theta Sorority Inc., and have been an active member for 20 years doing community service around the metro area. Unprecedented program for children of all ages. We couldn’t be happier sending our little ones to the center. Wonderful center! Educational, fun, safe, clean, caring… everything a parent could ask for! High-rating daycare/preschool; excellent activities, curriculum, qualified, caring teachers, cleanliness. Great child care and school. The staff is excellent. Our child learns so much, is well cared for, and enjoys everyday. We love it! We love St. Mary’s! The staff there is loving and helpful, and the facility is very clean and well organized. The preschool program is great, too. We love the wide array of topics covered and are amazed at how quickly our daughter is learning new things. I have recommended St. Mary’s to many and will continue to do so! [They have] The friendliest staff! A wonderful environment. My granddaughter LOVES St. Mary’s Child Care Center!!! The teachers are kind and loving. She has met many friends and gained knowledge through activities, books and interaction with other children and her teachers. The religious environment is very comforting. We chose St. Mary Child Care because it offered a safe space for our son with diverse activities and an experienced staff. The flexibility in the number of days your child can attend is great too. 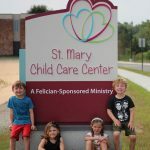 The quality of the facility and the staff are the primary reasons I would recommend SMCCC to anyone who is looking for daycare and preschool for their children. The administration continues integrity and tradition of SMCCC and the classroom teachers are truly the heart and soul of the Center. If I can’t be with my daughter all day, these are the people that I want her to be with. If Part-Time, How many Days per Week? Copyright 2019 St. Mary Child Care Center All Rights Reserved.